Breeze IT Checks In At #2040 on the 2016 Inc. 5000 List! 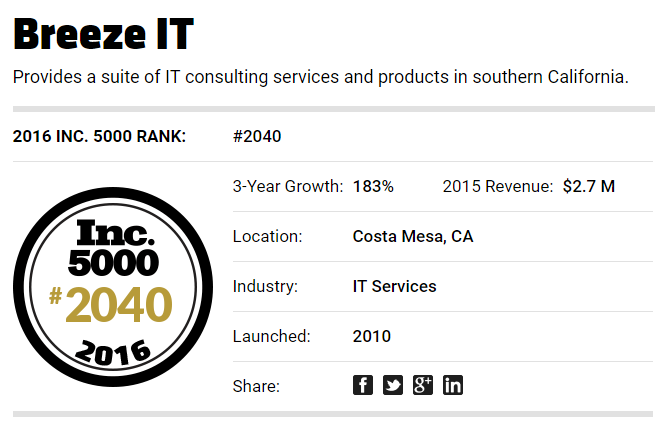 We couldn’t be more pleased to announce that Breeze IT, an industry-leading IT Solution Provider, has been named the #2040 Fastest Growing Private Company in America by Inc. Magazine’s 5000 list. The list represents a unique look at the most successful companies within the American economy’s most dynamic segment— its independent small businesses. Companies such as Microsoft, Dell, Domino’s Pizza, Pandora, Timberland, LinkedIn, Yelp, Zillow, and many other well-known names gained their first national exposure as honorees of the Inc. 5000.